This article is about publicly-traded companies. For enterprises owned by the state or a state entity, see State-owned enterprise. Replica of an East Indiaman of the Dutch East India Company/ United East Indies Company. 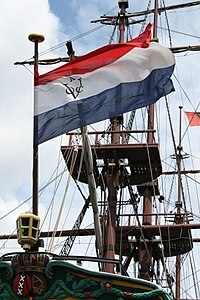 The Dutch East India Company (also known by the abbreviation “ VOC” in Dutch), the world's first formally listed public company,  started off as a spice trader. In 1602 the VOC undertook the world's first recorded IPO. " Going public" enabled the company to raise the vast sum of 6.5 million guilders quickly. In the early modern period, the Dutch developed several financial instruments and helped lay the foundations of modern financial system. The Dutch East India Company (VOC) became the first company in history to issue bonds and shares of stock to the general public. In other words, the VOC was officially the first publicly traded company, because it was the first company to be ever actually listed on an official stock exchange. While the Italian city-states produced the first transferable government bonds, they did not develop the other ingredient necessary to produce a fully fledged capital market: corporate shareholders. As Edward Stringham (2015) notes, "companies with transferable shares date back to classical Rome, but these were usually not enduring endeavors and no considerable secondary market existed (Neal, 1997, p. 61)." Usually, the securities of a publicly traded company are owned by many investors while the shares of a privately held company are owned by relatively few shareholders. A company with many shareholders is not necessarily a publicly traded company. In the United States, in some instances, companies with over 500 shareholders may be required to report under the Securities Exchange Act of 1934; companies that report under the 1934 Act are generally deemed public companies. Public companies possess some advantages over privately held businesses. Publicly traded companies are able to raise funds and capital through the sale (in the primary or secondary market) of shares of stock. This is the reason publicly traded corporations are important; prior to their existence, it was very difficult to obtain large amounts of capital for private enterprises - significant capital could only come from a smaller set of wealthy investors or banks willing to risk typically large investments. The profit on stock is gained in form of dividend or capital gain to the holders. The financial media, analysts, and the public are able to access additional information about the business, since the business is commonly legally bound, and naturally motivated (so as to secure further capital), to publicly disseminate information regarding the financial status and future of the company to its many shareholders and the government. Because many people have a vested interest in the company's success, the company may be more popular or recognizable than a private company. The initial shareholders of the company are able to share risk by selling shares to the public. If one were to hold a 100% share of the company, he or she would have to pay all of the business's debt; however, if an individual were to hold a 50% share, they would only need to pay 50% of the debt. This increases asset liquidity and the company does not need to depend on funding from a bank. For example, in 2013 Facebook founder Mark Zuckerberg owned 29.3% of the company's class A shares, which gave him enough voting power to control the business, while allowing Facebook to raise capital from, and distribute risk to, the remaining shareholders. Facebook was a privately held company prior to its initial public offering in 2012. If some shares are given to managers or other employees, potential conflicts of interest between employees and shareholders (an instance of principal-agent problem) will be remitted. As an example, in many tech companies, entry-level software engineers are given stock in the company upon being hired (thus they become shareholders). Therefore, the engineers have a vested interest in the company succeeding financially, and are incentivized to work harder and more diligently to ensure that success. Many stock exchanges require that publicly traded companies have their accounts regularly audited by outside auditors, and then publish the accounts to their shareholders. Besides the cost, this may make useful information available to competitors. Various other annual and quarterly reports are also required by law. In the United States, the Sarbanes–Oxley Act imposes additional requirements. The requirement for audited books is not imposed by the exchange known as OTC Pink. The shares may be maliciously held by outside shareholders and the original founders or owners may lose benefits and control. The principal-agent problem, or the agency problem is a key weakness of public companies. The separation of a company's ownership and control is especially prevalent in such countries as U.K and U.S. In the United States, the Securities and Exchange Commission requires that firms whose stock is traded publicly report their major shareholders each year. The reports identify all institutional shareholders (primarily, firms owning stock in other companies), all company officials who own shares in their firm, and any individual or institution owning more than 5% of the firm's stock. For many years, newly created companies were privately held but held initial public offering to become publicly traded company or to be acquired by another company if they became larger and more profitable or had promising prospects. More infrequently, some companies — such as investment banking firm Goldman Sachs and logistics services provider United Parcel Service (UPS) — chose to remain privately held for a long period of time after maturity into a profitable company. However, from 1997 to 2012, the number of corporations publicly traded on American stock exchanges dropped 44%. According to one observer (Gerald F. Davis), "public corporations have become less concentrated, less integrated, less interconnected at the top, shorter lived, less remunerative for average investors, and less prevalent since the turn of the 21st century". Davis argues that technological changes such as the decline in price and increasing power, quality and flexibility of computer Numerical control machines and newer digitally enabled tools such as 3D printing will lead to smaller and more local organization of production. A group of private investors or another company that is privately held can buy out the shareholders of a public company, taking the company private. This is typically done through a leveraged buyout and occurs when the buyers believe the securities have been undervalued by investors. In some cases, public companies that are in severe financial distress may also approach a private company or companies to take over ownership and management of the company. One way of doing this would be to make a rights issue designed to enable the new investor to acquire a supermajority. With a super-majority, the company could then be relisted, i.e. privatized. Alternatively, a publicly traded company may be purchased by one or more other publicly traded companies, with the target company becoming either a subsidiary or joint venture of the purchaser(s), or ceasing to exist as a separate entity, its former shareholders receiving compensation in the form of either cash, shares in the purchasing company or a combination of both. When the compensation is primarily shares then the deal is often considered a merger. Subsidiaries and joint ventures can also be created de novo — this often happens in the financial sector. Subsidiaries and joint ventures of publicly traded companies are not generally considered to be privately held companies (even though they themselves are not publicly traded) and are generally subject to the same reporting requirements as publicly traded companies. Finally, shares in subsidiaries and joint ventures can be (re)-offered to the public at any time — firms that are sold in this manner are called spin-outs. Most industrialized jurisdictions have enacted laws and regulations that detail the steps that prospective owners (public or private) must undertake if they wish to take over a publicly traded corporation. This often entails the would-be buyer(s) making a formal offer for each share of the company to shareholders. The shares of a publicly traded company are often traded on a stock exchange. The value or "size" of a company is called its market capitalization, a term which is often shortened to "market cap". This is calculated as the number of shares outstanding (as opposed to authorized but not necessarily issued) times the price per share. For example, a company with two million shares outstanding and a price per share of US$40 has a market capitalization of US$80 million. However, a company's market capitalization should not be confused with the fair market value of the company as a whole since the price per share are influenced by other factors such as the volume of shares traded. Low trading volume can cause artificially low prices for securities, due to investors being apprehensive of investing in a company they perceive as possibly lacking liquidity. For example, if all shareholders were to simultaneously try to sell their shares in the open market, this would immediately create downward pressure on the price for which the share is traded unless there were an equal number of buyers willing to purchase the security at the price the sellers demand. So, sellers would have to either reduce their price or choose not to sell. Thus, the number of trades in a given period of time, commonly referred to as the "volume" is important when determining how well a company's market capitalization reflects true fair market value of the company as a whole. The higher the volume, the more the fair market value of the company is likely to be reflected by its market capitalization. Another example of the impact of volume on the accuracy of market capitalization is when a company has little or no trading activity and the market price is simply the price at which the most recent trade took place, which could be days or weeks ago. This occurs when there are no buyers willing to purchase the securities at the price being offered by the sellers and there are no sellers willing to sell at the price the buyers are willing to pay. While this is rare when the company is traded on a major stock exchange, it is not uncommon when shares are traded over-the-counter (OTC). Since individual buyers and sellers need to incorporate news about the company into their purchasing decisions, a security with an imbalance of buyers or sellers may not feel the full effect of recent news. ^ Taylor, Bryan (6 Nov 2013). "The Rise and Fall of the Largest Corporation in History". BusinessInsider.com. Retrieved 18 August 2017. ^ "World's oldest share". The World's Oldest Share. Retrieved 8 August 2017. ^ "Dutch history student finds world's oldest share". Guinness World Records Limited 2014. 10 Sep 2010. Retrieved 8 August 2017. ^ "Student finds oldest Dutch share". Radio Netherlands Worldwide. 10 Sep 2010. Archived from the original on 8 August 2014. Retrieved 8 August 2017. ^ Dunkley, Jamie (11 Sep 2010). "Dutch student finds world's oldest share certificate". Telegraph.co.uk. Retrieved 8 August 2017. ^ Sylla, Richard (2015). "Financial Development, Corporations, and Inequality". (BHC-EBHA Meeting). As Richard Sylla (2015) notes, "In modern history, several nations had what some of us call financial revolutions.... The first was the Dutch Republic four centuries ago." ^ Kaiser, Kevin; Young, S. David (2013): The Blue Line Imperative: What Managing for Value Really Means. (Jossey-Bass, 2013, ISBN 978-1118510889), p. 26. As Kevin Kaiser & David Young (2013) explain, "There are other claimants to the title of first public company, including a twelfth-century water mill in France and a thirteenth-century company intended to control the English wool trade, Staple of London. Its shares, however, and the manner in which those shares were traded, did not truly allow public ownership by anyone who happened to be able to afford a share. The arrival of VOC shares was therefore momentous, because as Fernand Braudel pointed out, it opened up the ownership of companies and the ideas they generated, beyond the ranks of the aristocracy and the very rich, so that everyone could finally participate in the speculative freedom of transactions." ^ "Zuckerberg Now Owns 29.3 Percent Of Facebook's Class A Shares And This Stake Is Worth $13.6 billion". ^ Investopedia (14 August 2015). "If You Had Invested Right After Facebook's IPO (FB, TWTR)". ^ Devcic, John (September 21, 2014). "The Over-The-Counter Market: An Introduction To Pink Sheets". Investopedia. Retrieved February 15, 2017. ^ "Pink: The Open Market". OTC Markets. The Markets. Retrieved February 15, 2017. ^ a b "Myth #5. The Federal Reserve is owned and controlled by foreigners". Political Research Associates. Retrieved November 23, 2008. ^ "Is it time to rethink public corporations?". Minnesota Public Radio News. November 14, 2012. Retrieved February 15, 2017. ^ a b Davis, Gerald F. (April 24, 2012). "Re-imagining the corporation" (PDF). Ross School of Business, University of Michigan. Retrieved February 15, 2017. This page is based on the Wikipedia article Public company; it is used under the Creative Commons Attribution-ShareAlike 3.0 Unported License (CC-BY-SA). You may redistribute it, verbatim or modified, providing that you comply with the terms of the CC-BY-SA.